Erlenbach am Main, Germany. Both are 2,100-dwt ADNRType Ha double hull with stainless steel cargo tanks, each served by an individual deep well pump. Transportation Authority (E.U.PT A) of Kincheloe, Mich., recently com- pleted the replacement or overhaul of all ferry loading ramps on the St.
Detour, Mich., and one was con- structed at Drummond Island, Mich. The new Detour/Drummond Island route is serviced by a new 24-car ferry delivered in the fall of 1989. Mich. The primary ramps for De- tour/Drummond are 20 feet wide by 60 feet long with a mid-span hinge. Sugar Island are 20 feet wide with a 30 foot long single span. The hy- draulic pump system is located in a small heated building near the ramps. Low voltage controls are located on the ramps to raise/lower or tilt the span to meet the ferry. Iron Works, also based on Swan Is- land. 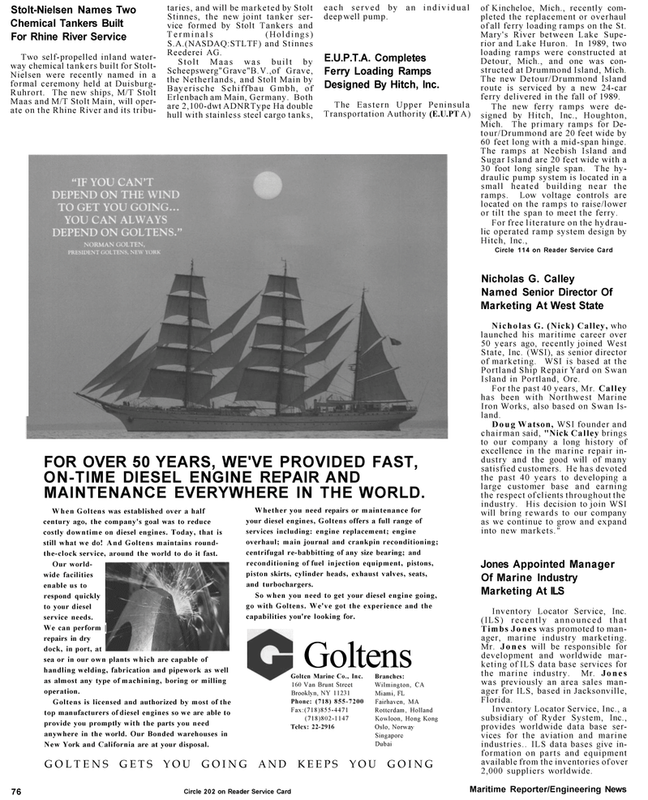 Doug Watson, WSI founder and chairman said, "Nick Calley brings to our company a long history of excellence in the marine repair in- dustry and the good will of many satisfied customers. He has devoted the past 40 years to developing a large customer base and earning the respect of clients throughout the industry. His decision to join WSI will bring rewards to our company as we continue to grow and expand into new markets." Timbs Jones was promoted to man- ager, marine industry marketing. Inventory Locator Service, Inc., a subsidiary of Ryder System, Inc., provides worldwide data base ser- vices for the aviation and marine industries.. ILS data bases give in- formation on parts and equipment available from the inventories of over 2,000 suppliers worldwide. MAINTENANCE EVERYWHERE IN THE WORLD. When Goltens was established over a half century ago, the company's goal was to reduce costly downtime on diesel engines. Today, that is still what we do! And Goltens maintains round- the-clock service, around the world to do it fast. Our world- wide facilities enable us to respond quickly to your diesel service needs. We can perform | repairs in dry dock, in port, at sea or in our own plants which are capable of handling welding, fabrication and pipework as well as almost any type of machining, boring or milling operation. New York and California are at your disposal. Whether you need repairs or maintenance for your diesel engines, Goltens offers a full range of services including: engine replacement; engine overhaul; main journal and crankpin reconditioning; centrifugal re-babbitting of any size bearing; and reconditioning of fuel injection equipment, pistons, piston skirts, cylinder heads, exhaust valves, seats, and turbochargers. So when you need to get your diesel engine going, go with Goltens. We've got the experience and the capabilities you're looking for.